Can’t make it to a class or workshop? Try one of Tanis’ popular DVDs! Myths, religions and archeological discoveries around the world discuss the presence of intelligent non-human beings who have interbred with humans creating hybrids. Tanis Helliwell offers convincing evidence in this DVD about the existence of 22 different human-hybrids (elementals, angels, dolphins, giants, dragons, centaurs, pan and many others). -How do we know that Hybrids exist? -What type of Elemental Hybrid am I? -Or, What type of Human Cousin Hybrid am I? -Or, What type of Star Being Hybrid am I? 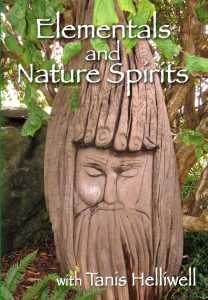 Learn to work and play with elementals, also called nature spirits, in this informative and engaging DVD with real images of elementals. Tanis Helliwell, well-known for her work with elementals (also called nature spirits) brings us easily into her world. Her DVD is informative while being entertaining. With the good-humoured spirit akin to an Irish story-teller she brings us on a journey to learn more about elementals. Tanis’ DVD has real images of fairies and lovely visuals that create a warm, natural environment that enhance her words. Viewers, who are both new to elementals, and those that have read a great deal, and even those who have encountered nature spirits, will find this DVD engaging. Some of the topics which are covered are: Purpose of Elementals, The Body Elemental, The Four Elements, Meeting Elementals, Learning from Elementals, Birth of the New Earth. DVD $14.95 more info and preview Available direct or from Amazon.com. Learn to co-create with Spirit in this informative and engaging DVD. You will discover what the signs of awakening are for both the Earth and individuals and why developing your spiritual intelligence (SQ) is essential in this new evolving world. Tanis will also discuss why it is important to develop a positive relationship with our body elemental and what some of the symptoms of spiritual transformation are. Chapters also include heart opening, becoming a conscious creator, and spiritual gifts, such as telepathy and astral travelling. This is an essential DVD if you are interested in the future of humanity and the Earth and can be used by individuals and study groups to facilitate your own transformation. The NEW self-study course Spiritual Transformation, is based on this DVD.